The destroyer USS Lowry (DD 770) fought off kamikaze planes in both the Philippines and Okinawa. This destroyer earned the nickname of Lucky Lowry by escaping damage for five months until being struck by a suicide plane on May 4, 1945. Luckily, only two Lowry shipmates died when the plane's wing clipped a 5-inch gun mount at the ship's stern and the plane's bomb exploded. This history, written by two gunner's mates who served aboard Lowry, describes many harrowing moments of this destroyer's encounters with kamikaze from December 1944 to June 1945. The diary and gun log kept by Jimmie Lewis Holbrook provide the principal sources for this chronological account of USS Lowry's combat operations. However, in places it becomes confusing as to when the narrative shifts to the book's other author, John Glenn Acord. The two authors paint an extremely positive picture of the destroyer's officers and crew. 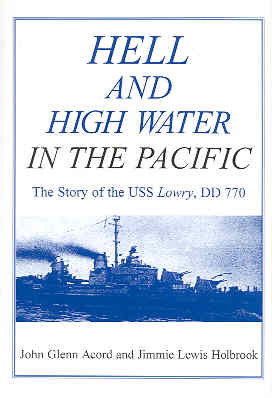 The two men worked together for a year to research and write Hell and High Water in the Pacific, which includes detailed descriptions of key events in Lowry's battle history. However, the book has few specifics on their job duties as gun mount captains. In addition, the book lacks any photos except for two wartime photos of the authors on the back of the book jacket. After Lowry's commissioning in July 1944 in San Pedro, California, the crew of 342 officers and men went on a shakedown cruise (trial run) prior to heading for battle in the Philippines. In the last half of December 1944, Lowry supported the invasion of Mindoro, where the ship's gunners shot down their first kamikaze plane and the crewmen witnessed for the first time a ship hit and sunk in a kamikaze attack. In January 1945, the destroyer participated in the invasion of Lingayen Gulf, which the authors refer to as "Suicide Gulf" due to the huge number of kamikaze planes and suicide explosive motorboats encountered by Allied ships. During the next month, Lowry joined a task force that launched carrier plane attacks against Tokyo and then proceeded to Iwo Jima to protect aircraft carriers near the small island. On March 21, 1945, Lowry left Ulithi to proceed toward Okinawa to support the invasion there that started on April 1. The month of April turned out to be relatively quiet for the destroyer whose main duty consisted of escorting the carrier force. However, the next two months were anything but quiet for Lowry's crew as they fought against numerous kamikaze attacks during radar picket duty. The US Navy had assigned destroyers to 16 radar picket stations around Okinawa in order to protect the main fleet by picking up Japanese planes early by radar and then guiding Combat Air Patrol planes to destroy them. However, many kamikaze planes targeted and hit these destroyers at radar picket stations rather than trying to get through to reach ships in the main fleet. The war ended with Lowry in the Philippines, but the destroyer then went to Japan to support the Allied occupation, and the crew observed the signing of the official Japanese surrender on the battleship Missouri. Lowry's crew witnessed several ships hit by Japanese kamikaze and several kamikaze planes shot down, but three attacks stand out. On January 9, 1945, while the ship was not at General Quarters, a lone Japanese plane suddenly came up over a hill behind Lingayen Gulf and swept down to hit the first ship in sight. A Lowry crewman named Doyle quickly jumped into the harness of an unmanned 20-mm gun and started firing, and he and another destroyer brought down the kamikaze plane. The kamikaze plane that approached from starboard and hit Lowry on May 4, 1945, came as a surprise, since the gunners' attention had been focused on two kamikaze planes on the port side that had been making a run on another destroyer ahead of them at the same radar picket station. The plane crash and its bomb killed two and wounded about 20 men aboard Lowry, but the ship escaped serious damage. Later in the day the souvenir-hunting crew helped themselves to pieces of the plane's wing that remained on the deck. In the early morning of May 28, 1945, the two destroyers Drexler and Lowry were stationed at Radar Picket Station 15 when a group of Japanese kamikaze planes attacked. Two planes, including one that passed directly over Lowry, crashed into Drexler and sank the ship within less than a minute after the second plane hit. The LCI (landing craft) that picked up Drexler survivors also took aboard three Lowry crewmen who had cracked up that morning due to shock. The two authors admit up front that they did not know much about publishing a book. However, this history of the destroyer Lowry turns out to be a valuable firsthand account by two gun mount captains who witnessed many kamikaze attacks in the Philippines and Okinawa.